A year or two ago I bought some lovely simple blue and grey fabrics at a delightful little quilt shop somewhere in the middle of nowhere in Switzerland. They are German fabrics, but I have about as much chance of remembering the name of the producer as I have of remembering the name of the shop – is this old age setting in? My memory is shocking these days. The plan was really to make a large bag with the fabric, but you know me: why make a bag when you can make a quilt? So over the last couple of weeks I’ve whizzed this little thing together out of 4 inch squares, backed it in Ikea words fabric and quilted it very simply in the ditch. Probably the easiest quilt it’s possible to make. It fits perfectly in my bedroom and is right in line with my move to live a simpler life. It has made me very happy. Both in the making and in the having and using. (It’s small by the way – just sits ontop of a double duvet, with no room to drop down the sides of the bed). This entry was posted on Saturday, April 19th, 2014 at 8:00 am	and is filed under Quilting. You can follow any responses to this entry through the RSS 2.0 feed. Both comments and pings are currently closed. This is a lovely little quilt Helen. I especially love all those muted spot fabrics. I think maybe I need to make some smaller quilts too instead of thinking I always need to make a queen size which then just makes everything take longer. I love the way it already looks like a well loved and used quilt. 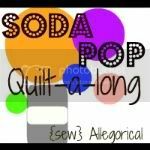 It is a very peaceful and calming quilt and a great make. 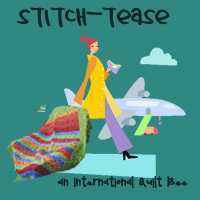 You did a post about your quilt shop adventure January 17, 2013 (I make a mental note of places you mention for future visits to Switzerland)…you have a lot on your plate at the moment, but you and your friend need another quilt get away! I’ve been loving a few quick and simple projects recently, this looks lovely. Perfect. I keep thinking I should make fancier quilts but you know I love a quilt of simple squares! I love those soft blues and grays–our neighbor just told me she’s expecting (and it’s a baby boy). This quilt will be my inspiration for their gift! a simple and fast finish can be so gratifying. Simple can be the best!! Simple patchwork quilts are my favourites, I think. I want to make one with a Kate Spain layer cake I’ve had hidden in my stash for the last year. Yours is incredibly soothing with those lovely muted colours. No wonder you love it so much. dieser Shop heisst The Quiltplace in Nürensdorf. Aufgrund deines so begeisterten Blogs über diesen Shop war ich ebenfalls schon einige Male dort – herrlich, die Auswahl als auch die herzliche Betreuung! Wenn du Zeit finden solltest, schau doch dort wieder mal rein – andernfalls, neu führen die zwei Damen auch einen Internetshop! Just lovely. Looks like something even I have time/energy/talent enough to make!